I just met with six officials from China National Radio who mostly wanted to learn about NPR's Emergency Alert System. Mike Starling of NPR Labs joined us and explained that since 1952, the government has had 33 'primary entry points' for the Federal Emergency Management Agency to use if the White House wants to send out an emergency notice. In 2002, NPR became the 34th 'primary entry point' because NPR has member stations in all state capitals. 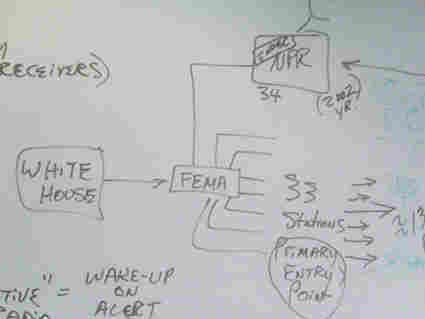 FEMA can contact NPR and then a message could go out to the 800 public radio stations NPR reaches. China National Radio dwarfs NPR, reaching 100 million listeners in a week, Xiaohui Wang, CNR's deputy director general said through an interpreter. CNR is the only domestic radio that covers the whole country. The Chinese government pays for the transmission and for programming that reaches senior citizens, children and the disabled. But CNR has to raise money for all other programming. CNR has no position like an ombudsman or a press council, but you can sign onto the website and comment on stories. "We have very, very critical listeners, especially among the younger people," said Wang. "We say they use Internet language violence. It's sometimes very aggressive language. They aren't criticizing the government. They are criticizing us."